Picture this. You walk up to any mom on the street and ask, “How are you?” What will she answer? “I’m tired.” We all know the symptoms of being tired as a mother. When we’re tired, what do we yearn for? ENERGY! We want to be able to grab a toddler off the stairs 800 times a day, fix meals day after day, help with homework, remember to run to the post office, and so much more. We are exhausted, so we reach for SUGAR or CAFFEINE as our fix. But what if that solution is actually making the problem WORSE? Here is the problem with sugar. It’s so rapidly digested that we get that immediate high, but then the sugar crash, which leaves us depleted, and wanting more sugar. More addictive than cocaine, sugar leads to irritability, anxiety, nervousness, headaches and foggy thinking. Mommin’ ain’t easy, and this just makes it all worse. It can impact our sleep quality, so we can already expected to be sleepy tomorrow. Plus, it can lead to a bunch of diseases. The cycle of crave --> sugar intake --> blood sugar spike --> insulin released --> blood sugar drop --> feel like garbage --> sugar intake….it keeps us on a roller coaster. Kinda makes that donut not worth it. Let’s talk about caffeine, both in coffee and soda. Don’t we just love that first cup of coffee in the morning? Don’t worry, we won’t make you end your relationship with java. The thing is, coffee is a fair-weather friend that can turn on you. While it does increase our performance and alertness, and it does have health benefits, it can also lead to insomnia (especially if used in the afternoon). Coffee is a chemical stimulant that we develop a tolerance for, so we need more and more just to “get going” and start our day. Mom, you might be hooked on a drug. It gets worse. Too much coffee can impair our mood, worsen performance, and LOWER our energy levels. We can get headaches and cranky. The constant stimulation produces the stress hormones adrenaline and cortisol (the same stress response as if we had to outrun a bear). And this will blow your mind. Studies show that coffee drinkers don’t have better mood, energy, or performance compared to NON-coffee drinkers. So if we’re hooked on coffee, it’s simply to achieve normalcy, not to have energy to tackle the day. That means those who don’t drink coffee are just as energized as those who do drink coffee (but they don’t have the dependence on caffeine fatigue). Dang. Well, what about soda? Can a Coke be our afternoon pick-me-up? Coffee has more caffeine than soda, but soda has more sugar than coffee (around 8 teaspoons). Soda leaves you more sluggish than before (thanks, sugar crash) and it dehydrates (which makes you even more tired). It causes weight gain and contributes to plenty of diseases too. The appeal fizzles out. So what are we supposed to do? Our job is the hardest on earth and we are depleted and spread thin every day with so many demands. Do we just stay in mombie mode? Here’s the fix. Keep your blood sugar level stead with protein, vegetables, complex carbohydrates, and healthy fats. Exercise. Drink water. Reduce your stress. 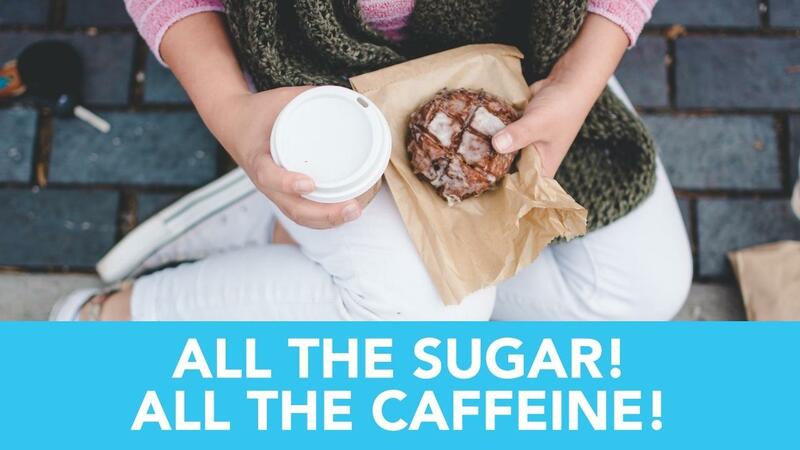 Avoid sugary foods, processed foods, refined carbs, and over-caffeinating (again, we don’t have to quit coffee). And use BCAA’s (Branched Chain Amino Acids). How do our BCAA’s help with energy? They fight fatigue as they block the “tired” hormone tryptophan from traveling to the brain, so that means less serotonin is in effect (no nap needed now)! When we use Momsanity BCAA’s, the amino acids help provide natural energy (without any caffeine)! Oh, and it’ll help you stay hydrated and energetic too! Finally there’s a way to boost our energy without any awful side effects! CLICK HERE TO TAKE OUR FREE QUIZ TO FIND OUT IF YOU ARE CAUSING YOUR EXHAUSTION WITHOUT EVEN KNOWING IT!